If you have a few extra hard-boiled eggs lying around this Easter period, fear not – I have the perfect recipe for you! This recipe is based on the Swiss-German Nüsslisalat and uses a type of leafy green called lamb’s lettuce or mâche (doucette or rampon in French). 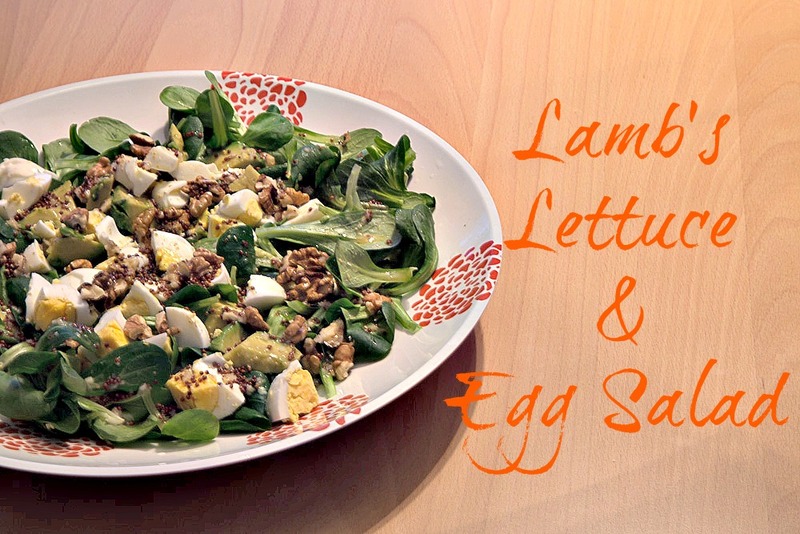 Lamb’s lettuce has its humble origins as a weed which was found growing among cereal crops in Europe. It became an important source of nutrients during winter as one of the few types of salads that grows during this period, and is traditionally eaten in early Spring as well. It is a good source of vitamin C, iron and beta-carotene and has a delicate, nutty taste that is quite distinctive. This Easter salad is very high in good fats found in the walnuts, avocado and olive oil as well as protein from the eggs. Because healthy fats and protein are actually more filling than most carbohydrates (especially refined ones like white bread), you can eat this alone as a meal in itself without needing bread or anything else to make it more filling. I always find it ironic that people trying to be healthy have a really light salad without much protein or fat and then fill up on bread. Add healthy fats and protein instead and notice how filling a salad becomes! It is enough for two people as a main dish or 4 as a starter. Research is increasingly showing that even though eggs contain cholesterol, they do not increase cholesterol in the body. Eggs are actually one of the healthiest foods you can eat, containing high-quality protein, healthy fats, vitamins, A, D, E, K and B12, folate and iron. The most important thing is to make sure you buy organic, free-range eggs – meaning that the hens lived outside and where fed a natural diet. Happy Easter everyone! I hope you had a wonderful day! I thought these yoga bunnies were very cute and fitting for the season. They combine my love of cute looking animals and yoga. And speaking of yoga, I can’t believe I haven’t mentioned it on this blog yet! So here goes…I started yoga about 5 years ago, going to class once a week with my dear friend, Vanessa. But it was only when I started a more regular yoga practice 2 years ago that I really started feeling a difference in both the way I feel, my posture, and my ‘progress’ as a yogi. I now take 20-45 minutes several times a week to do some yoga at home. I found that using a website like yogaglo.com makes me feel I have my own private yoga teacher without even needing to go to the studio. And even though yogaglo has a great varieties of classes and teachers you can choose from, I only ever do Elena Brower’s classes. She is that good! I still go to real life classes, as nothing beats being corrected by real teachers, and I found a center with some great teachers here in Geneva. The styles of yoga I prefer are Anunsara/Hatha and Kundalini – two very different styles that I choose depending on how I am feeling. 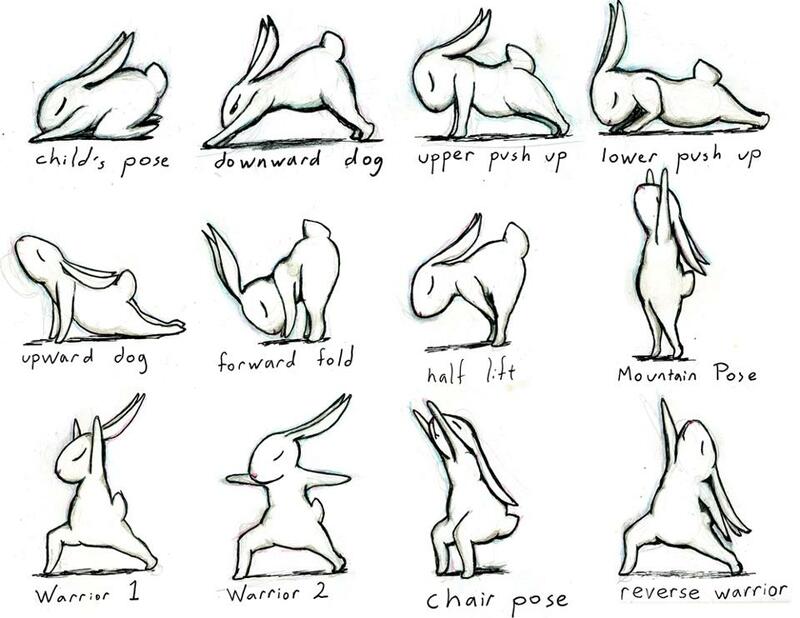 Anunsara/Hatha is similar to the bunny positions shown below, while Kundalini uses movement and the breath to work on energy in the body. The beauty of yoga is that there are so many different styles, that I am sure it is possible for everyone to find a style they enjoy. What about you, do you do yoga? What style do you prefer?